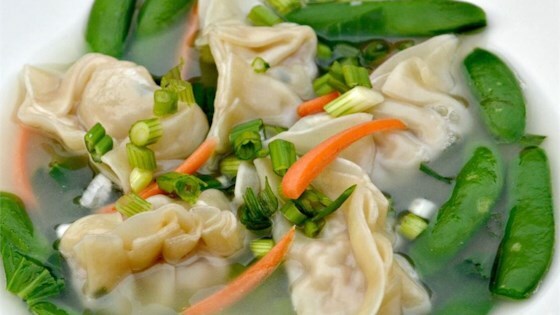 "Steamed pork-filled wontons and steamed vegetables make a hearty and satisfying soup." Whisk rice wine and cornstarch together in large bowl. Add ground pork, 2 tablespoons green onion, soy sauce, ginger, sesame oil, and sugar; stir until well combined and paste-like, about 10 minutes. Cover and refrigerate for 1 hour. Place about 1 tablespoon pork mixture in the middle of a wonton wrapper. Brush edges with beaten egg and pinch edges to seal, creating a small pouch. Repeat with remaining wonton wrappers and pork mixture. Refrigerate until ready to use. Place a steamer insert into a saucepan and fill with water to just below the bottom of the steamer. Bring water to a boil. Add bok choy, snap peas, carrot, and 2 tablespoons green onion, cover, and steam until tender, 2 to 6 minutes. Remove and distribute evenly among 4 soup bowls. Place wontons in steamer basket and steam until pork is no longer pink inside, about 10 minutes. Remove and place in soup bowls alongside vegetables. Heat chicken broth and water in a saucepan until hot, 5 to 7 minutes. Pour hot broth mixture evenly into soup bowls atop vegetables and wontons. Sprinkle 1/4 cup chopped green onion evenly over each bowl. I would not steam the veggies and wontons separately. Poach them in the broth and the broth will have a more complex flavor. Overall - this is a nice fresh meal. Love it !!! Soo delicious !! And would definitely recommend it! I tried this last night as is and it was as good as any wonton soup I have ever had. Really like that there was a lot of veggies. Best soup ever! I made for 15 friends and they loved it! This is the first time I've made wonton soup and I'm happy to say this recipe was great! The wontons tasted just like they came from any good restaurant. This was great. I would take Baking Nana's tip to not steam anything, just poach it in the pot for best flavor.